The OM7605C8 is supplied on tape and reel. 1k or 3k pcs per reel are the standard T&R pack sizes for this product. Partial quantities may be supplied on tape (no reel), or in bulk. 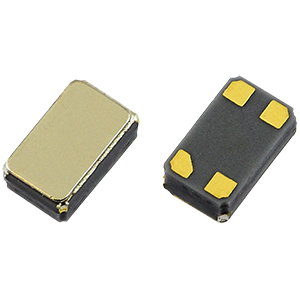 An ultra-miniature 32.768kHz oscillator, the OM7605C8 is operable from 1.6~5.5V and features tight calibration tolerance, ultra-low current consumption of 0.45μA typical, and has optional AEC-Q200 qualification. The OM7605C8 has ±20ppm calibration tolerance, with other values available on request. This oscillator also features low ageing characteristics of just ±3ppm first year maximum at 25°C. Encased within an ultra-miniature 2.0 x 1.2 x 0.7mm ceramic package with metal lid, the OM7605C8 also has good shock and vibration resistance and is available with -40 to +85°C operating temperature range. To request a quotation for the OM7605C8 please use the configurable options form to choose the options you require and then submit your configured product to our team. Our expert advisers are always happy to help with your requirements and can be contacted on +44 1460 256 100 or at sales@golledge.com.